NEW! 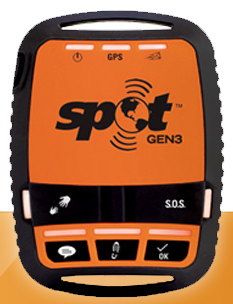 SPOT Gen3® The latest generation of award-winning SPOT devices, SPOT Gen3 gives you a critical, life-saving line of communication using 100 percent satellite technology. Are they crazy? Running 155.343 miles across the Sahara Desert with temperatures soaring to 122 degrees Fahrenheit the participants struggled, and 22 were in life-threatening situations. There was something that came to their rescue, a phone. Globalstar Europe Satellite Services Ltd., a wholly owned subsidiary of Globalstar Inc. (NYSE MKT: GSAT) that provides satellite messaging and emergency notification technologies, revealed that SPOT Gen3 safety device was instrumental in rescuing 22 participants in this year’s MARATHON DES SABLES (MDS), the world’s most extreme running race. Each of the 1,250 competitors ran the 250 km (155.343 miles) across the Sahara Desert with a SPOT Gen3 on their backpack, allowing MDS race organizers, emergency support teams, sponsors, family and friends to precisely track each runner’s location through a service hosted by WAA Tracking, a Globalstar VAR partner and geolocation solutions specialist. The one-touch SOS button on SPOT Gen3 also gave competitors an easy way to let organizers know if they got into trouble. During the grueling multi-stage race across the sands of Morocco, the MDS team was able to precisely locate 22 competitors in distress and quickly dispatch rescue personnel. At one point the team was coordinating the simultaneous rescue of six separate competitors. All race marshals also carried the small, rugged devices, and they were attached to security vehicles, medical vehicles, helicopters and even a camel. With temperatures up to 50 degrees Celsius (122.0 degrees Fahrenheit), sand storms and tough terrain, competitors did occasionally miss the markers and stray off course, however, WAA’s geo-fencing software alerted the support crew to quickly dispatch a rescue team. Day three of the event was the busiest day for emergency assistance, with 11 rescues occurring due to extreme heat and sandstorms. Each incident involving a ground crew was completed in just minutes and two helicopters were nearby in case their assistance was required. WAA’s customized tracking website hosted 180,000 unique visitors during the event which was held April 8-18, while over 3 million unique visitors followed the event via official social media platforms and websites. By following the competitors’ progress, supporters around the world knew when to watch the live finish on the webcam. In one incident, when a competitor started veering off-course, WAA Tracking’s geo-fencing software alerted race headquarters instantly. The competitor was moving away from the official route in an area that was particularly difficult to access, even for the team’s experienced 4x4 drivers, so one of the race organizer’s two helicopters landed close by. The doctor on board checked the athlete’s health and declared him able to continue the race. The crew advised the athlete how to get back on course since any competitor who is transported is automatically disqualified.